The pretty Oasis of Huacachina is located in the desert, about 4 km outside the town of Ica. It is only a small village with maybe about 100 inhabitants living around a natural lake and surrounded by high sand dunes. The origin of the name Huacachina seems to come from the words “waqay china”, which means “crying woman” in the local language Quechua. There are different local legends about the emergence of the lake. But in general storyline talks about a beautiful princes, with a beautiful voice who fell in love with a brave warrior. The warrior died in a battle and the sad princes looked for a quite spot to cry. She kept crying until her tears formed a lake. When she looked in her mirror she saw a hunter who spied on her and she decided to walk into the lake to hide. When the hunter left and she wanted to leave the lake again she noticed that her legs were gone and that she had turned into a mermaid. Some of the elderly locals in Huacachine will tell you that on a quiet night you can sometimes hear the mermaid sing. Now you know why there is a statue of a mermaid at the edge of the lake in Huacachina. Many locals believe that bathing in the lake is good for your skin and can cure arthritis, rheumatism and even asthma. The healing water and mud of Huacachina were its first tourist attraction and even the wealthy from Lima travelled down south to receive e healthy Spa treatment. When the interest of the wealthy faded a tourist company called Desert Adventures started early 90’s to offer adventures buggy rides through the sand dunes around the lake. This became a huge success and Huacachina started to grow again as a popular tourist destination. Nowadays this little village attracts each year tens of thousands of tourists from all over the world, mainly backpackers. 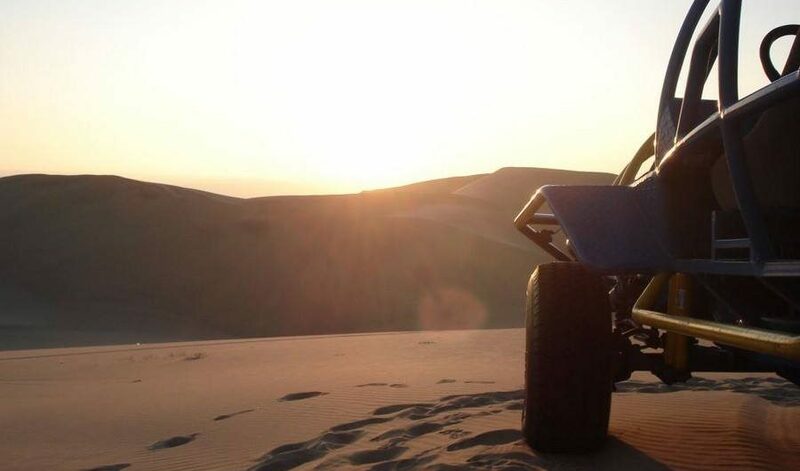 The spectacular Sunset Buggy Tours are for sure the main tourist attraction of Huacachina. Depending on the season these tours start between 16:00 and 16:30 h and last for around 2 hours, until the sun goes down behind the huge sand dunes. Usually the adventures rides are alternated with short stops to practice Sand Boarding. The price of this tour is somewhere between 35 and 45 Soles p.p., which is exclusive the new 4 Soles conservation fee for Huacachina. Sand boarding might look the same as snowboarding, but when you stand on a sand board you will quickly find out that it’s a very different technique. Most people who practice sand boarding for the first time will therefore quickly decide that’s more fun to either sit on the board or lay down on your stomach while gliding at high speed down one of the sand dunes. A warning note is in place here. Keep in mind that sand at high speed becomes very sharp and can easily burn and open the skin of your arms and legs. Therefore it’s important to keep your limps on the board and avoid direct contact with the sand when gliding down. Long trousers instead of shorts will also provide more protection. Short video of sandboarding in Huacachina. More recently camping tours in the desert are increasing in popularity and with reason. The camping tours start like any other Sunset Buggy Tour, but after watching the sunset you will drive to a quiet spot in the desert, surrounded by high sand dunes. Upon arriving you will set up the tents and can help the driver to start a small bonfire and prepare the BBQ. Sheltered from any artificial lights the clear desert sky provides excellent opportunities to watch the stars and even the giant Milky Way! With a bit of patience there is also a good chance to spot a shooting star and make a wish. The next day you will drive early back to Huacachina. Note: nights in the desert can be fairly cold, so be well prepared. The growing flow of tourists provoked a quick growth of tourist facilities in Huacachina. The small village now contains over a dozen tour agencies, several bars, restaurants and even a small nightclub. Also the amount of hostels and hotels in and around Huacachina has grown. Some of the more known hostels include: Desert Nights, Casa de Arena and Salvatierra, all with their own small restaurant, bar and even swimming pool, for a laid-back experience. If you want a bit more luxury/ comfort you can choose for hotels like Hostal Curasi, El Huacachinero and Hosteria Suiza. In the 1980’s heavy use of water by big agricultural companies in Ica caused the ground water level to go down and the natural supply of water to the lake in Huachachina stopped. In the years after the water level of the lake started to go down until it had maybe lost up to 80% of its water! In 2015 a group of businessmen and scientists finally started a project in order to safe Huachacina as an Oasis and important tourist attraction. The growing flow of tourists also poses a threat to the authenticity of Huacachina. In 2011 congress therefore approved a new law in which Huacachina was declared intangible in order to protect the oasis as a good place to life and as an attractive tourist attraction. In 2014 a law was put in place to try to protect Huacachina and its surrounding up till an extension of 2407 hectare. The area has to be kept clean, buildings are not allowed to be higher than 2 floors and new buildings in Huacachina aren’t allowed to extend towards the sand dunes. In 2015 the municipality of Ica created the following commision: “Comité de Gestión del Área de Conservación Regional Laguna de Huacachina” with the aim to make both the citizens and tourists in Huacachina more conscience about protecting the environment. In 2016 and 2017 they also organized so called cleaning days during which groups of volunteers collected hundreds of kilos of rubbish from the dunes around Huacachina. On Earth Day, the 22nd of April 2018 the local volunteer organization Eco Dunes put together an international group of volunteers to help collecting rubbish from the sand dunes of Huacachina. These cleaning initiatives are great, but it is sad that they are still needed. In the long term it would be best if both the citizen of Huacachina and its tourists take better care of this special place and protect the Oasis for future generations. Next postPotosí, the most important American City!